Jesus was a great public speaker. We know that because millions of people around the world are still to this day listening to his speeches in awe and wonder. And like any great public speaker he knew how to get the audience’s attention. Today he begins his speech, “If anyone comes to me without hating his father and mother, wife and children, brothers and sisters, and even his own life he cannot be my disciple.” Now there is an opening line that will grab your attention. Right? Jesus was enormously popular with the crowds as a great healer, brave teacher, and miracle worker. But clearly in his mind they didn’t understand what following him was all about. So he turned to them and makes this dramatic statement. His point is: if you want to follow him, if you want to be a Christian, then you need to be ... ALL IN. No half way followers allowed; this needs to be the most important thing in your life. If the language in Luke’s Gospel is a little too harsh for you, listen how Jesus says the same thing in Matthew’s Gospel. “Whoever loves father and mother more than me is not worthy of me” (Mt 10:37). No matter how you say it, the point is clear there should be one absolute priority in our life. One love that is more important than anything else in our life. And that’s your love of God. Is God first in your life? Is Jesus the love of your life? Jesus forces us today to ask ourselves: Do we love Jesus more than everyone else? Do we put him before parents, spouses, children, even our own lives? Or, does something else take first place in our lives? This Gospel reading sets a high bar for any of us who call ourselves Christians. He tells us he cannot be merely a part of our life. He cannot be just an important “ingredient” in our life occupying an important “niche” in our personal portfolio. He must be first. 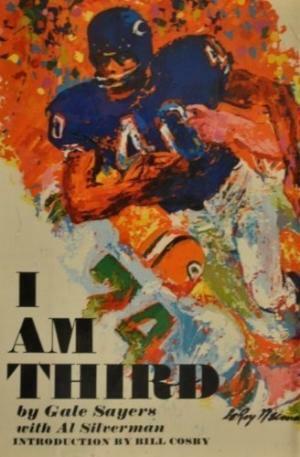 When I was growing up, my favorite football player was a man named Gale Sayers who played with the Chicago Bears back in the 1960s. I still think he’s the greatest running back who ever played the game. Around his neck, he always wore a gold medal about the size of a half-dollar. On it were inscribed three words: I Am Third. The second point that Jesus makes in today’s Gospel reading is about realizing that there is a cost to being his follower. He said – “If one of you is planning to build a tower, he sits down first and figures out what it will cost to see if he has enough money to finish the job.” In other words, it’s not enough to give top priority to God – you need a plan. Gale Sayers said in his book: “It’s one thing to put God first in your life. It’s quite another thing to live out that decision.’’ The message for us today is clear. If we are just going through the motions of our faith we’ve missed the point of what it means to be a disciple of Jesus. Today in Rome the Church honors a person who took this teaching and lived it in the extreme. Today Mother Teresa of Calcutta will be declared a saint of our church. 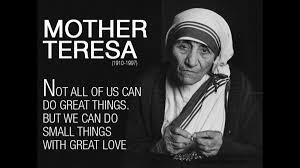 Mother Teresa was .a simple Catholic woman who after 20 years teaching high school in a comfortable convent school for rich girls, at age 38, launched a ministry in the streets of Calcutta India to the poorest of the poor. Something in her heart told her she was holding something back. That to be – ALL IN – she needed to do more. She left the comfort of her convent and went into the streets where there was filth and ugliness; where she face the daily death of adults and babies from starvation and illness. She lived in the extreme Gayle Sayer’s motto. She put God first, the people she served second, and her own needs a distant third. She lived in a small room with no symbols of affluence. They say she could pack to move in about 10 minutes. She learned to keep her needs to a minimum so she could focus on loving Jesus through those she served. Today the Church honors her as a great saint. Most of us will never live the kind of life she did, few of us are called to such an extreme life. But we can follow her lead in putting Jesus first in our lives and then looking for how we are called to make a difference in the world – as she did. Mother Teresa often said that the greatest hunger in the world is not for bread, but for love. If we put others in second place behind Jesus and love them profoundly, then we’ve put God first others second and ourselves third. Jesus is calling us out of our comfort zones today. Abraham Heschel thought of prayer as not an occasional exercise but rather like an established residence, a home for the innermost self. In his essay On Prayer, he says that all things have a home: the bee has a hive, the bird has a nest. For the soul, home is where prayer is, and a soul without prayer is a soul without a home. Continuity, permanence, intimacy, authenticity and earnestness are its attributes. I enter as a stranger and emerge as next of kin. I may enter spiritually shapeless, inwardly disfigured and emerge wholly changed. We pray because there is a vast disproportion between human misery and human compassion. We pray, he said, because our grasp of the depth of suffering is comparable to the grasp of a butterfly flying over the Grand Canyon.